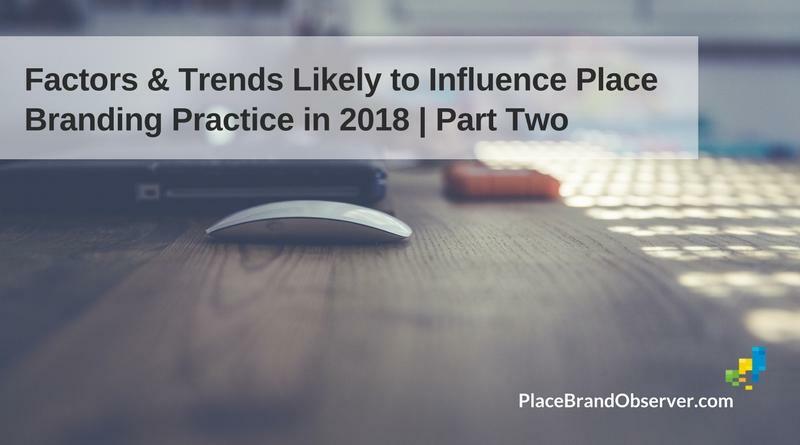 The changing role of branding, according to our panel of place brand researchers, advisors and managers, is one of the main factors and trends likely to influence place branding practice in 2018. From the first application of branding to commercial products to the way we understand place branding today, the role of this interdisciplinary endeavor is ever-changing. In their responses, some of our experts focused precisely on this, trying to understand how are current tendencies affecting place branding and marketing practice, and what will its role be in the imminent future. Chris Fair saw the importance of measurable results, explaining that place branding professionals will be increasingly challenged to demonstrate these. This will lead to seeking out objective approaches and new methodologies of developing place branding and marketing strategies. He pointed out that this means the practice will become more outward than inward looking. According to Fair, organisations today are learning that successful place branding is less about how the local community wants to be perceived and more about communicating the strengths to target audiences. The need for new methodologies to determine the competitive advantages and differentiating characteristics is seen here, as places and organisations need to “achieve a result that is both measurable and desirable for all the stakeholders involved”. Joao Freire [Grounded Brands] focused on the potential disputes between stakeholders in regards to “which target segments should be supported and which investments should be made”. According to him, this will lead to development of new models of governance which include relevant stakeholders, such as tourism industry players, universities, companies and cities. Heather Skinner pointed out the increase in place branding professionals and organisations, suggesting there is a rise in awareness of the importance of this practice. There might be a tie between this and Andrew Hoyne’s thinking that the market will finally need to understand and acknowledge the meaning, value and difference between place branding and place marketing. Juan Carlos Belloso concurs, explaining that too many places and place administrations still see branding linked to the idea of creating a logo or a tagline, not understanding the “strategic value of properly focused place branding and place brand management”. He particularly saw the need to overcome political interests and short term visions to place branding initiatives. Hoyne identified the partnership mindset, collaborations between government departments and independent local businesses as the key trend that will continuously grow and innovate the practice. According to him, this will lead to “much-needed change and improvement within local government”, particularly for the slow moving local governments forced to change by information-rich stakeholders. Hoyne also foresees the emergence of powerful and well-funded stakeholder groups, “interested in place brand work of quality and resonance”. Somewhat similarly, Jordi de San Eugenio Vela thought many public administrations will have to turn their attention to place branding strategies as “a great opportunity to improve the economic development and promotion of territories”. Ed Burghard focused on the global trends relating to economic development, seeing “the pendulum swinging back to economic nationalism”. According to him, this will have a direct impact on trade deals and create new alliances, but also a challenging environment for less developed nations to grow their economies. Keeping on the subject of finance, Jeremy Tamanini thought the cost of living in global cities that drives talent away might be an opportunity for smaller, peripheral suburbs to grow. He sees recently forgotten zones on the urban periphery gaining in attractiveness “if their leaders can articulate the right mix of price, place and proximity to these young workers”.